I am a conservative trader, and I focus on creating a constant stream of income for myself, doing this through the selection of trend-following, directional plays. While trading short term, directional options strategies is in and of itself aggressive, I do this with a more conservative take. I trade with a small account, and my choices in both strategies I use and setups I take reflect that. This is my overall theme when making decisions about strategies and position sizing. What kind of trader are you? My aggression level in any singular trade is determined by my technical analysis, perceived level of strength of the setup, overall market conditions, risk allowed per trade relative to my overall account size, and my account growth goals. I prefers to maximize my risk/reward ratio, and limit my risk, and try and be as precise as I can with my entries and exits. I trade in a methodical fashion, repeating my favorite setups again and again, and I’m always looking to hone my strategies. However, risk is always of utmost importance. The factors I look at can give you a good idea about how you should manage your own risk, and select which strategies are appropriate for your account. At the end of the day, you need to know what is right for you. Don’t forget – the relative risk of a strategy is also coupled with the position size you use when you place it, which should also reflect appropriately on your account size. Account Goals: I don’t like to think of an overall yearly profit, instead I prefer to think in terms of paying myself weekly income first, with growth as a secondary objective. You can only take what the market can give you on a week by week basis, but I like to analyze my results at week end and start fresh the next week. 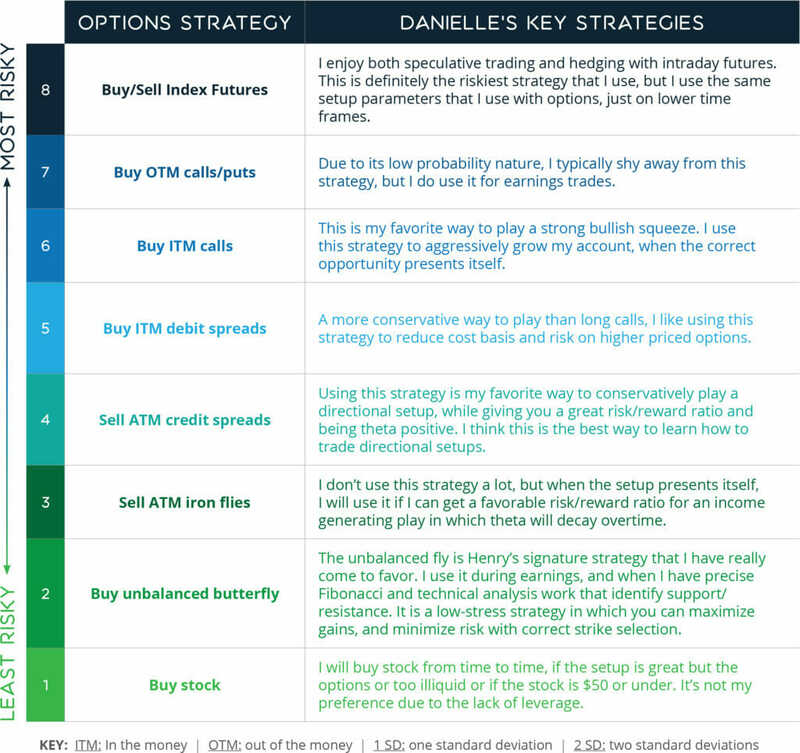 Overall Acceptable/Recommended Account Risk: To understand Danielle’s current account parameters, it’s important to look back at where she’s been. When I first started trading, I paper traded for a year and a half. This allowed me to get a firm grasp of the strategies that I was using, and allowed me to select my favorites once I began trading with real cash. After I started trading with real money, I kept very strict guidelines, while making sure I was earning the right to trade larger. I began, risking about 0.05% of my account in any given trade. I never placed more than one trade on any ticker. I started with conservative goals, of $50 profits per day. As I got better, I upped my position size to 1%, then 2.5% of my account per trade. I changed my goals from $50 per day, to $100, and then $200. This is with drawdowns of no more than $200 per day. Now, I currently risk between 5-10% of my account on my absolute favorite, high probability setups, and keep risk at around 2.5% on lower probability trades. My goals for 2018 include consistent wiring out of money along with aggressive account growth. I try not to risk more than 40% of my account at any given time. This risk is spread across multiple different positions, that are in a variety of different sectors. Strategy Use + Risk Taken Per Setup: Position size & strategy utilized per trade dependent on perceived strength of setup, while keeping risk parameters in mind. 5-star setups get 8-10% of my account, while 4 star will get 5% allocation. For earnings trades, I stick with 2.5% due to their more unpredictable nature. Methodology: I spend an immense amount of time going through the indexes, ETF sectors, Carolyn’s Fibonacci setups and our Simpler Trading scanner to identify the moves I want to trade. I primarily focus on directional, trend following moves that I think have the highest probability of giving me a greater than expected move. I focus primarily on the squeeze, in combination with any of the above setups. I do most of my research in the evenings, and then combine that with analysis of my fellow traders in our trading room to select my setups. ← The FOMC Trade: New Year, New Head, New Hike. Thank you for all the time and effort you put in to help us. Thanks for being here! I’m glad you’re finding it useful. Hope to see you in the trading room!